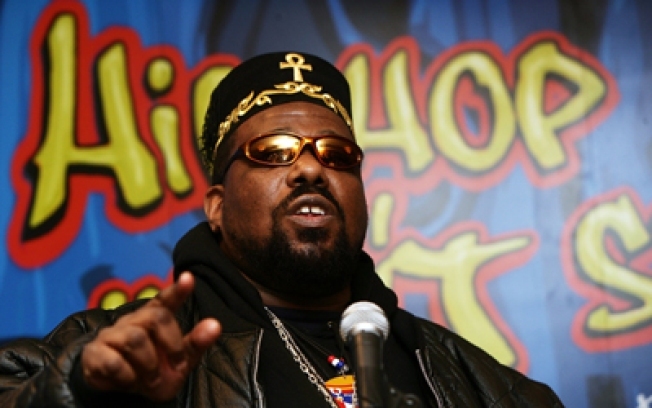 Hip-hop pioneer Afrika Bambaataa rocks (Le) Poisson Rouge on Saturday. ICON: With more crazy headgear than Elton John, hip-hop éminence griseAfrika Bambaataa's still got it. Catch him at (Le) Poisson Rouge with a special 11PM show alongside Low B and Million $ Mano. RETRO: Sunday's the last day to catch the cheeky stage production based on Alfred Hitchcock's The 39 Steps at the Cort Theater (it'll move to the Helen Hayes later this month). The small, clever show is the perfect antidote to big, overblown holiday-season silliness. DELICATES: Surely you have a few pennies left from all that retail nuttiness to stuff your own stocking - and what better place to do so than at Agent Provocateur's sample sale? Get naughty bits and pieces half off regular prices. Saturday 11AM-7PM, Sunday 12-6PM, through 1/10.